The two primary keys to rabbit nutrition are providing plenty of fibre, primarily in the form of hay, and being consistent in what you feed. First, let’s address the fibre issue. Rabbits are hind gut fermentors meaning they digest much of their food in the caecum and colon (large intestine), which are at the end of the digestive tract. In the rabbit, the caecum (in humans our appendix is our caecum) is a large blind-ended sac located at the junction of the small and large intestine. The caecum is about 10 times as large as the stomach and makes up approximately 40% of the digestive tract. Within the caecum, bacteria and protozoa aid digestion of foods taken in by the rabbit. Fibre is needed for bacteria and protozoa in the caecum to stay in balance and function properly. Fibre also stimulates motility or movement of the gastrointestinal tract and allows the rabbit to keep ingested food moving properly so that normal digestion can take place. Without fibre the gastrointestinal tract slows down, resulting in subsequent changes in the caecum pH, fermentation, and bacterial population. With time these changes result in rabbit indigestion or gastrointestinal (GI) stasis. 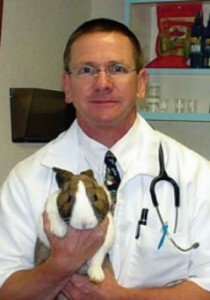 The rabbit with GI stasis will be anorexic or have a reduced appetite. An affected rabbit produces very small stools or none at all and may be hunched or in pain due to increased gastrointestinal gas formation. Diarrhea may or may not be present. Since hay is the primary source of fibre in a rabbit’s diet, feed it free-choice, which means you always have plenty of fresh, good quality hay available for your bunny. Hay is a dried, cured preserved plant product fed to animals. The primary types of hay include grass hay (timothy, oaten, brome, and orchard) and legume hay (alfalfa/lucerne, clover, pea, and peanut). Many factors go into the nutritional value and quality of hay. These include soil, weather conditions during growth and harvest, and the stage of maturity when the hay is harvested. These factors will affect the appearance and palatability of the hay you purchase and how long it can be stored and stay in good condition. As a general rule we recommend grass hay over legume hay (timothy vs. lucerne) for the average adult house rabbit. The primary reasons are that timothy hay is lower in protein and calcium and higher in fibre than most lucerne hay. High dietary calcium has been associated with urine crystal or bladder stone formation. Therefore, feeding timothy hay over lucerne hay can potentially prevent this problem. The higher fibre helps keep the rabbit’s digestive system in balance and along with lower protein encourages the ingestion of nutrient-rich cecotrophs or night faeces. Lucerne can be fed to young bunnies under the age of six months since it provides extra calcium necessary for growing bones. Just be sure you offer grass hay as well, so when it comes time to wean them to strictly grass hay they will know the taste and be less likely to resist change. Furthermore, you can feed lucerne to rescue bunnies that are thin and weak or bunnies recovering from major surgery or severe illness. Lucerne tends to be very appealing to the rabbit’s taste bud and will promote weight gain and give a nice bloom to the fur. Another consideration is in our older bunnies, which during the last stages of their lives may have reduced appetites, and can be enticed to eat by offering lucerne. When it comes to feeding pellets we recommend high-fibre pellets that are over 20% fibre and less than 16% protein. As a general rule we recommend ¼ cup pellets per 1.13 kg of body weight per day. Of course this can vary. Obese rabbits and rabbits with gastrointestinal motility problems need limited amounts of pellets, regardless of how much fibre the pellets contain. Pet Care Veterinary Hospital’s pellet of choice is Oxbow Essentials – Adult Rabbit Food. It is specifically formulated for the adult mature house rabbit and helps prevent obesity as well as urinary stone or ‘sludge’ problems (again because of the lower calcium level in timothy hay). Also, if your bunny absolutely refuses to give up lucerne hay, the timothy-based pellet doesn’t compound the problems associated with eating excess lucerne. WOW! All that time discussing fibre – but only because it is sooooo important! The other key to maintaining a nutritionally healthy rabbit is consistency in what you feed. If you stick with a consistent healthy diet, the bacterial population within the rabbit also stays healthy and consistent. So, if we are to supplement our bunny’s hay and pellets with greens, vegetables and fruits, we need to be consistent and offer the same types of these foods every day. The reason for this goes back to the all-important microbial (bacterial) population within the rabbit’s intestinal tract. These microbes thrive on consistency and stay in balance when offered the same foods to digest day-in and day-out. You see, when you feed carrots, let’s say for three days, you stimulate the growth and reproduction of the bacteria that digests carrots. Now if you stop the carrot for several days, those bacteria, which have a short life span die due to lack of carrot to digest. When microbes die in large numbers they sometimes give off gas which can be painful and uncomfortable. The rabbit can stop eating for awhile, and without new fibre intake, intestinal gut motility slows down. This is the start of bunny indigestion, which can lead to gastrointestinal stasis or “hairball” syndrome if this pattern repeats itself. Be consistent and intelligent in the types of and quantity of greens and vegetables you feed your rabbits. Introduce vegetables one at a time to make sure each agrees with your rabbit’s digestive tract. Approximately 1 cup vegetables per 1.8 kg of body weight daily are appropriate for most rabbits. Some suggestions include: Cos lettuce, Butter crunch, Red leaf lettuce, Coriander, Parsley, Carrot tops, Dandelion greens and Kale. Carrots aren’t my favourite (as they contain a lot of sugar and carbohydrates) – but if you must use them, feed only small amounts daily. Avoid gas-forming vegetables such as broccoli and cauliflower. Many owners want to offer treats to their rabbits. A treat should be enjoyable to eat and provide interaction between you and your pet. When fed in limited quantities, herbs (fresh or dried) or fruits can be offered as treats. Pieces of banana or apple are favorites with rabbits. Again, in order to prevent gastrointestinal upset, it is best to feed the same treats consistently. 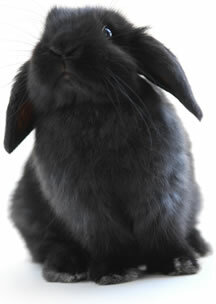 I see so many rabbit health problems in my practice which are related to nutrition and improper diets. Hopefully this information will help keep many a rabbit’s gastrointestinal tract moving smoothly and their overall health top notch.